uuid : 72fc95e1-f392-4e88-b86f-f8df73154c06 templates_id: 119507 templates_uuid: "d70c58f0-9f93-4951-b298-6ae3cd8e4ef9" title: "Heads of Terms Sample - Heads of Agreement Template " display_name: "Heads of terms" meta_keywords: "Term sheet, HOT and Heads of agreement " description: "
Record proposed terms during negotiations between two parties using this heads of terms. Heads of terms - whilst not usually legally binding are useful when recording what is to be included in a proposed agreement and what is not. This heads of agreement has options to include legally binding obligations of confidentiality, exclusivity and non-solicitation. 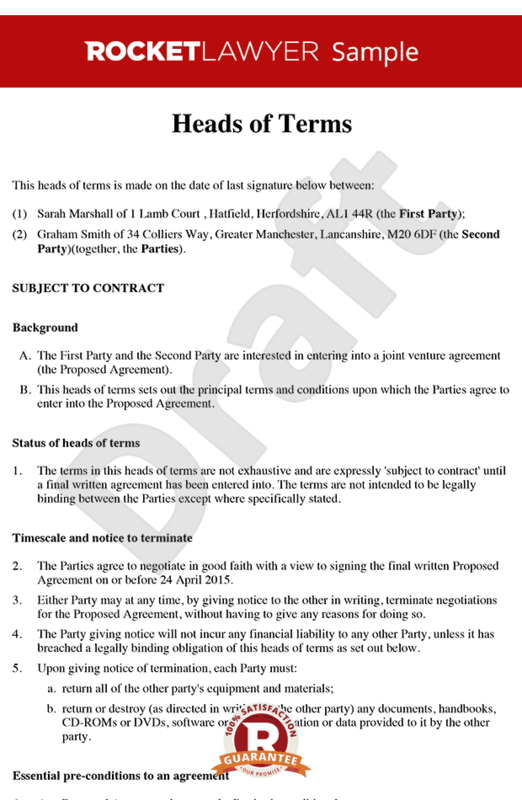 A heads of terms agreement provides the basis for a future agreement between two businesses. It can be drafted as a letter between two businesses known as letter of intent, rather than a contract. However, the effect of these two documents is the same. Do I need heads of terms? You will need heads of terms in order to record business negotiations and discussions where the outline and details of the terms of a future agreement have been agreed. You can use this document turing ongoing negotiations and once the negotiations are complete to ensure that both parties understand their obligations. What are the examples of proposed agreements that these heads of terms can be used for? Exclusivity provisions - which prevents the parties from negotiating with anyone else for some period of time. Non-solicitation provisions - which prevents the parties poaching each other\302\222s employees and customers. However, the time and scope of the provisions (non-solicitation and confidentiality) must be reasonable. In this document you can choose the period of time for both exclusivity and non solicitation, which varies from 30 to 60 days for exclusivity and 1 to 12 months for non-solicitation. Preconditions are conditions that must be met by either party before the finalised agreement can take effect. In this document, you may require the other party to fulfill some conditions such as submitting certain key documents (eg safety certificates), or you may need the approval of the shareholders to enter into this agreement. What are the remedies available for non-compliance with heads of terms by either party?
" created_timestamp: "2018-10-08 04:36:30.0" modified_timestamp: "2018-10-08 04:36:30.0" active: true created_by: 102 modified_by: 102 dcm_id: 320 url_slug: "Heads-of-terms" meta_description: "Record proposed terms during negotiations between two parties using a heads of terms template . Try this heads of agreement sample to set out agreed terms.\r\n" time_to_complete: "15 minutes"
Non-solicitation provisions - which prevents the parties poaching each others employees and customers. More than just a Heads of terms template, our step-by-step interview and guidance makes it easy to create your document. Easily create online, download, print and sign your free Heads of terms in minutes. This document is also sometimes called: Term sheet, HOT and Heads of agreement .